While looking up some information on Cumberland Gap I ran across something that all you heritage tourists and genealogists out there might enjoy. It’s a firsthand account of one man’s long-distance bike ride through the Gap and along Boone’s Wilderness Road, following the same route his ancestors took all the way to Indiana. 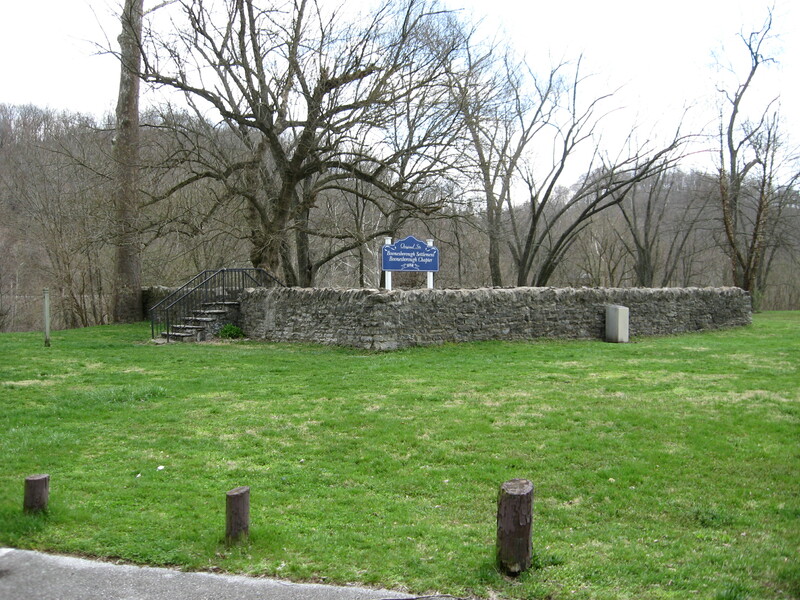 In the fall of 1778 a large force of Indians, most of them Shawnees, laid siege to Fort Boonesborough in central Kentucky. The fort held out, but the siege provides some pretty nifty examples of military ingenuity. 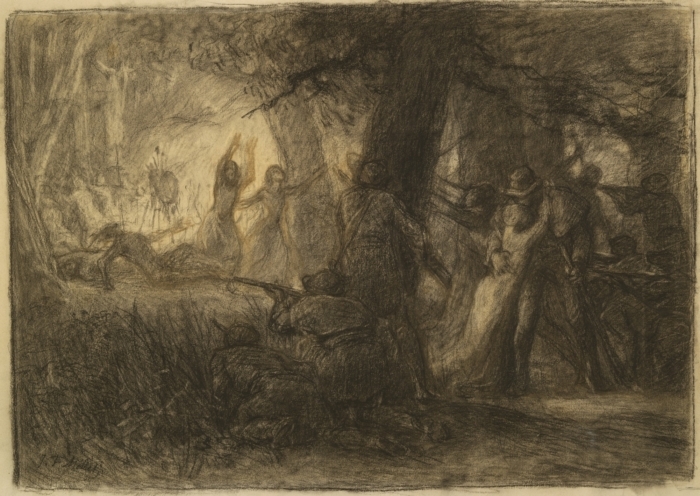 Native American attempts to capture frontier garrisons were usually pretty straightforward affairs, with a party of warriors surrounding the walls and firing from cover along with attempts to fire the structure with torches or flaming arrows. At Boonesborough, the Indians got creative. 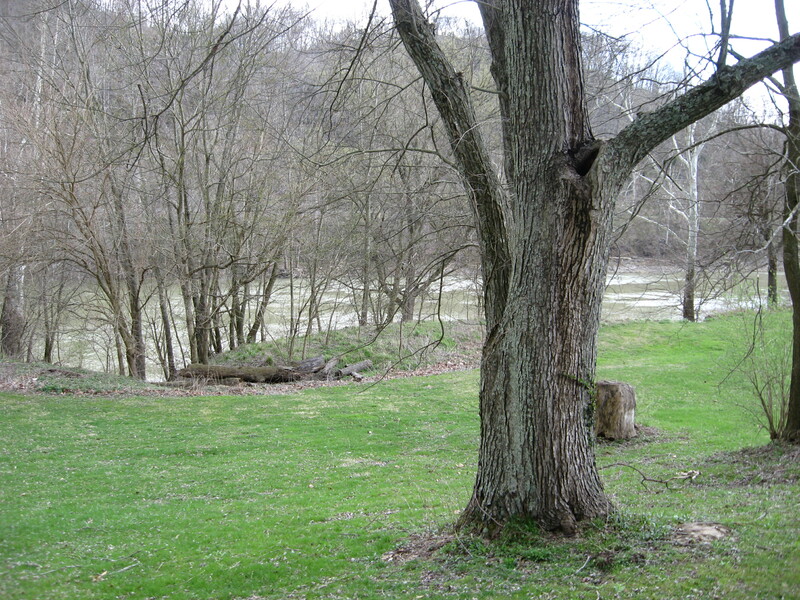 The Kentucky River ran parallel to the fort’s rear wall and about sixty yards away from it. The attackers decided to tunnel into the bluff along the stream and dig a mine toward the settlers, either to gain access to the interior or to set off a powder charge under the walls. The defenders heard the digging and saw the river’s water turn muddy, and figuring out what was up, they set to work on a counter-mine. The Indians’ tunnel collapsed before reaching the fort, but it was still a pretty interesting approach to frontier warfare. The whites inside the fort developed a few tricks of their own, thanks to the ingenuity of Daniel Boone’s brother Squire, who built a makeshift cannon out of gum wood bound with iron wagon wheel strips. The second shot blew the barrel apart, prompting derisive shouts from the attackers. (One notable thing about participants’ recollections of the siege was the frequency of verbal insults traded between the two sides.) Not the most effective of weapons, but the bang did cause a party of Indians to “skamper perdidiously,” as Daniel Trabue put it. Another of Squire Boone’s inventions proved more effective during the siege when he managed to fashion squirt guns out of rifle barrels to douse the Indians’ torches. I’ve never been able to figure out exactly how these things worked, but apparently some type of piston was involved. This guy was like an eighteenth-century MacGyver. So, who’s up for an experimental archaeology project? Picture something along these lines, only with a nice maple stock. They’ve brought in an archaeologist from across the pond to look for remains of the 1778 siege. I went there a few years ago; it’s a neat site. Anybody who thinks the history of early America doesn’t continue to cast a long, dark shadow over modern culture should consider the pressing matter of Confederates on Mars. 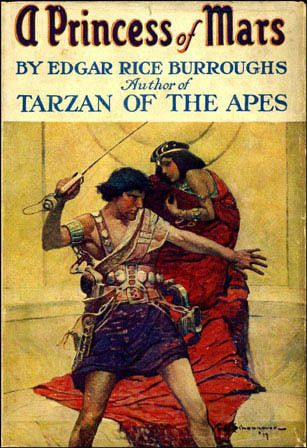 I’m referring, of course, to the new movie John Carter, and to its source material, the century-old story A Princess of Mars by Edgar Rice Burroughs. Both the book and the film relate the adventures of an Army of Northern Virginia veteran who finds himself mysteriously transported to the Red Planet, referred to by its inhabitants as “Barsoom.” This fictional Mars is populated by tall, green-skinned, six-limbed aliens called Tharks, as well as a race of humans (or humanoids, I suppose) with copper-red skin whose cities are perpetually at war with each other. Carter is taken captive by the Tharks, gets mixed up in Barsoomian politics, and falls in love with a scantily-clad humanoid princess named Dejah Thoris. It would be hard to overstate the influence of A Princess of Mars and its sequels on science fiction. I decided to read it for myself before seeing the film, and was surprised at how many of the scenarios, characters, and themes from later movies and books were right there in embryonic form within the pages of Burroughs’ story. What also struck me was a remarkable degree of similarity between this seemingly outlandish tale of extraterrestrial swashbuckling and some very real accounts from the early American frontier. Because Carter finds himself in a dangerous environment populated by “primitive” races, you could interpret A Princess of Mars as a frontier story, and many people have done so. In particular, let me discuss a number of intriguing parallels between Carter’s fictional experiences and historical accounts left behind by Anglo-American colonists and settlers. Take clothing, for example—or rather, the lack thereof. One of the things colonists found most striking about Indians was their “nakedness,” interpreting their exposed bodies as signs of barbarity. The inhabitants of Barsoom, both the Tharks and the red humanoids, also go largely unclothed, wearing only elaborate metal ornamentation, jewels, and the straps holding their weapons. Carter describes a Thark leader as “heavily loaded with metal ornaments, gay-colored feathers and beautifully wrought leather trappings ingeniously set with precious stones.” The metal ornamentation is an apparently ubiquitous feature of Barsoomian dress which the text mentions again and again, and it brings to mind the European gorgets and trade bracelets worn by Indians of the Eastern Woodlands. Thark weaponry also seems reminiscent of Native American weaponry of the colonial and Revolutionary frontier. The green Martians carry rifles which fire bullets equipped with explosive “radium,” and they employ these firearms at long distances to deadly effect. For close-quarters combat, they wield edged weapons. Carter’s opinion of the Tharks reflects Anglo-Americans’ paradoxical attitudes toward their aboriginal neighbors. On one hand, colonists considered the Indians barbaric. On the other, they sometimes idealized the Native Americans as exemplars of primitive virtue, a notion summed up in the phrase “noble savage.” In the same way, Carter finds the Tharks to be cruel and warlike, raising their children communally with no pity for the weak. Like some historic Native American tribes, Tharks find a kind of collective catharsis in making a violent spectacle of their prisoners. Whereas the Iroquois and other Indian societies vented tribal anger through the communal torture of captives, the Tharks punish troublesome prisoners by forcing them to do battle with monstrous creatures in a gladiatorial arena. But Carter also notes the Tharks’ admirable qualities. They possess what might be called a savage code of honor, and their leaders maintain their status by their prowess in combat. This regard for prowess is how John Carter earns the respect and even admiration of the Tharks. Martian gravity being distinct from that of his home planet, the former Confederate is capable of tremendous physical feats on Barsoom, turning him into a virtual superman. In time, he becomes a member of Thark society. Burroughs’ book is thus not merely a story of an encounter between cultures, but a story about an individual from one culture who finds himself immersed in a culture that is not his own. For that reason, I think we can be more precise about its historical antecedents than calling it a “Western” or a frontier story. I suggest that it’s a particular type of frontier story, one that really predates the “Western” as most of us are used to thinking about that term. As one of the first great science fiction epics, A Princess of Mars is an early example of a relatively new genre, but it’s also a comparatively recent example of a very old genre, perhaps the oldest genuinely American genre there is—the captivity narrative. Captivity narratives are accounts of people who fall into the hands of another culture, a culture which the captive considers less civilized than his or her own. There are very early examples from Europe, but the genre really took off in the New World, where the proximity of aboriginal societies and the frequency of cross-cultural warfare increased the likelihood of cross-cultural captivity. The most notable example is probably Mary Rowlandson’s account of her capture during King Philip’s War, one of the first American “best-sellers.” Like the captivity memoirs of Rowlandson, Jonathan Dickinson, and other whites who were held by Indians for some period of time, A Princess of Mars takes an autobiographical form, since Burroughs employs the device of a “false document,” a manuscript written by Carter and left in the care of a relative, to tell the story from the protagonist’s own perspective. The book thus takes the same form as non-fiction firsthand accounts of cross-cultural imprisonment, except that it’s a work of the imagination rather than memory. Consider the relationship in these accounts between imprisonment and adoption. While living among the Tharks, Carter earns the right to wear the metal and bear the prestige of the warriors he defeats in battle. When he dons their ornaments and straps, he becomes a full-fledged member of their society and even a prominent figure within it. In the same way, Indian tribes in eastern North America adopted captives taken in war; indeed, the taking of captives to “replace” dead relatives was one of the purposes for which Native Americans engaged in warfare. The relationship between Carter and the Thark chieftan Tars Tarkas is especially worth noting. Tarkas is the first of the green aliens to appreciate Carter’s remarkable physical abilities. The two become close, even though Tars Tarkas is the Earth man’s captor. Their relationship is not unlike that between Daniel Boone and the Shawnee leader Blackfish, who seems to have adopted the frontiersman during Boone’s imprisonment at Chillicothe in 1778. Her face was oval and beautiful in the extreme, her every feature was finely chiseled and exquisite, her eyes large and lustrous and her head surmounted by a mass of coal black, waving hair, caught loosely into a strange yet becoming coiffure. Her skin was of a light reddish copper color, against which the crimson glow of her cheeks and the ruby of her beautifully molded lips shone with a strangely enhancing effect. She was as destitute of clothes as the green Martians who accompanied her; indeed, save for her highly wrought ornaments she was entirely naked, nor could any apparel have enhanced the beauty of her perfect and symmetrical figure. She is sufficiently alien to be exotic and alluring, but unlike the Tharks, she is someone in whom Carter can recognize a common humanity. Here is an example of the impulse to fantasize about the frontier as a venue for cross-cultural romantic escape, perhaps the same impulse that might have led John Smith to invent, exaggerate, or misinterpret the occasion on which Pocahontas reportedly intervened to save his life. The first time Carter lays eyes on Dejah Thoris, she is a fellow captive of the Tharks, and the Virginia gentleman takes it upon himself to protect her. Later, when she falls into the hands of a rival society, Carter undertakes a dramatic rescue. By this point in the book, Carter is no longer a prisoner, but a Martian warrior engaged in rescuing a vulnerable female from danger, just as Daniel Boone led a raid to rescue his daughter from Indian captivity in a famous 1776 incident. The native of Earth has transformed from a captive into a master of his dangerous new world, just as Boone became the archetype of the white man at home in the treacherous environment of the frontier. Carter’s decision to pledge his heart and his sword to Dejah Thoris marks a point at which his story and the early American captivity narratives part ways. For Anglo-American captives who wrote down their stories for colonial audiences, an important theme was “redemption,” the experience of coming out of captivity. John Carter, by contrast, is one of those captives who chooses to stay among his adoptive people and take up a new identity. Unlike Mary Rowlandson, these “converted” captives did not leave behind such influential accounts of their passages across the cultural boundary. They remained on the far side of that boundary, never again at home in the society in which they were born. John Carter finds on Barsoom an escape from all the unpleasant aspects of American civilization; his frontier, like that of many Americans who wrote about their own, is a source of renewal. Having fought as a soldier for a lost cause on Earth, and having gone west in search of fortune, he unexpectedly becomes a hero on another world. Rather than looking for redemption from captivity and exile, he finds that his captivity and exile redeem him. In introducing Carter’s “memoir,” Burroughs writes that after the hero of Mars returned to his home planet, he would stand outside at night, “with his arms stretched out to the heavens as though in appeal.” Maybe the reason Burroughs could create a popular hero who dreamed of returning to the far side of the cultural frontier is because the actual, historical frontier of America was no longer a threat close at hand. To early Anglo-American colonists, the Indians were nearby, numerous, and threatening. But Burroughs wrote his story more than two decades after the U.S. Census Bureau declared the frontier closed and the Native Americans’ last great act of military resistance to white encroachment came to an end. The real frontier had become a distant object of nostalgia, almost as distant as Mars must have seemed to John Carter when he was back on Earth, gazing at the night sky toward the faraway home of his Martian princess. I ran across a post suggesting some possible subjects for historical biopics. The LBJ idea is especially intriguing; I wouldn’t mind seeing a miniseries adaptation of Robert Caro’s work. I’d also propose Frederick Douglass (great story), John Brown, Joseph Smith, and Daniel Boone as interesting film subjects. 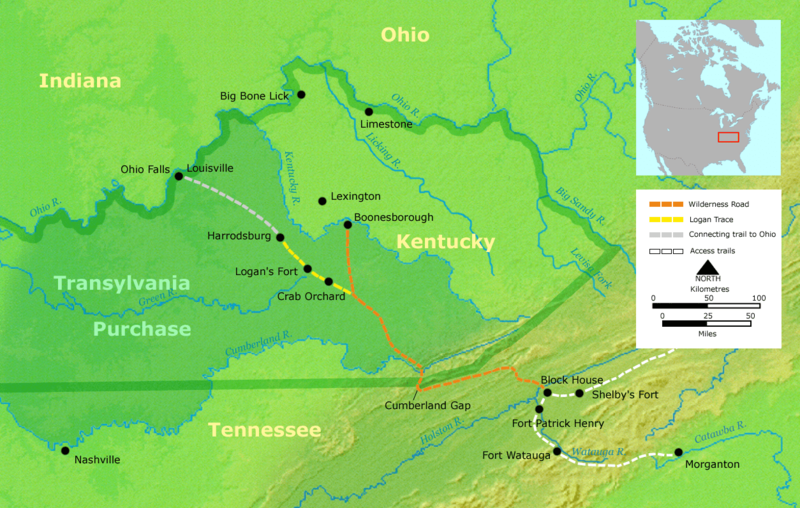 Boone’s life in particular is full of dramatic material; the deaths of his sons, the rescue of his daughter, his captivity, and his court-martial would all make for powerful scenes, and then you could wrap it up in melancholy fashion with his abandonment of the Kentucky for which he gave up so much and migration to Missouri. Personally, though, what I’d really like to see is an Andrew Jackson biopic along the lines of Patton, depicting both his greatness and his faults. I’d start out with his boyhood in the Revolutionary Waxhaws and the beating he took for defying a British officer, and then flash forward to the War of 1812. Either that, or just adapt David Nevin’s novel 1812 as a miniseries. I rarely read historical fiction—I don’t read much fiction at all, actually—but that was a genuinely great book, and anybody who could play Jackson the way Nevin managed to flesh him out would deserve a Golden Globe.